"What's Going On (album)" redirects here. For other albums by this title, see What's Going On (disambiguation). What's Going On is the eleventh studio album by American soul singer, songwriter, and producer Marvin Gaye. It was released on May 21, 1971, by the Motown Records-subsidiary label Tamla. Gaye recorded the album between 1970 and 1971 in sessions at Hitsville U.S.A., Golden World, and United Sound Studios in Detroit, and at The Sound Factory in West Hollywood, California. It was his first album to credit him as a producer and to credit Motown's in-house studio band, the session musicians known as the Funk Brothers. What's Going On is a concept album with most of its songs segueing into the next and has been categorized as a song cycle; the album ends with a reprise of the album's opening theme. The narrative established by the songs is told from the point of view of a Vietnam veteran returning to his home country to witness hatred, suffering, and injustice. Gaye's introspective lyrics explore themes of drug abuse, poverty, and the Vietnam War. He has also been credited with promoting awareness of ecological issues before the public outcry over them had become prominent. The album was an immediate commercial and critical success, eventually being regarded as a classic of 1970s soul. In 2001, a deluxe edition of the album was released, featuring a recording of Gaye's May 1972 concert at the Kennedy Center in Washington, D.C. Broad-ranging surveys of critics, musicians, and the general public have shown that What's Going On is regarded as one of the greatest albums and a landmark recording in popular music. In 2003, Rolling Stone ranked it sixth on the magazine's list of the "500 Greatest Albums of All Time", and also in an updated list nine years later. Gaye experienced personal and professional turmoil in the late 1960s and part of his refocusing on music was attending concerts from the Detroit Symphony Orchestra at Orchestra Hall at the Max M. Fisher Music Center. By the end of the 1960s, Marvin Gaye had fallen into a deep depression following the brain tumor diagnosis of his Motown singing partner Tammi Terrell, the failure of his marriage to Anna Gordy, a growing dependency on cocaine, troubles with the IRS, and struggles with Motown Records, the label he had signed with in 1961. At one point, Gaye attempted suicide at a Detroit apartment with a handgun, only to be saved from committing the act by Berry Gordy's father. During this time, Gaye began experiencing international success for the first time in his career following the release of "I Heard It Through the Grapevine" and subsequent hit singles such as "Too Busy Thinking About My Baby", "Abraham, Martin & John" and "That's the Way Love Is". But Gaye was in no mood to celebrate: "My success didn't seem real. I didn't deserve it. I knew I could have done more. I felt like a puppet—Berry's puppet, Anna's puppet. I had a mind of my own and I wasn't using it." During this time, Gaye was able to prove his worth as a producer, producing several songs for Motown vocal group The Originals. The songs, "Baby, I'm for Real" and "The Bells", became hits as a result. On March 16, 1970, Terrell succumbed to her illness, a month before her 25th birthday. Gaye dealt with Terrell's death by going on a prolonged seclusion from the music business. After his success with the Originals, Gaye changed his look, ditching his clean-cut, college boy image to grow a beard and dressing more casually, wearing sweatsuits. Gaye also pierced his ear in defiance and stood up to Motown executives who felt he should have been touring. He also began working on fixing his personal issues, re-embracing his spirituality and also attended several concerts held by the Detroit Symphony Orchestra, which had been used for several Motown recordings in the 1960s. Around the spring of 1970, Gaye also began seriously pursuing a career in football with the professional football team the Detroit Lions of the NFL, even working out with the Eastern Michigan Eagles football team. However, Gaye's pursuit of a tryout with the Lions was stopped after being advised that an injury would derail his music career, leaving him upset. Despite this, Gaye would befriend three of the Lions teammates, Mel Farr, Charlie Sanders and Lem Barney, as well as the Detroit Pistons star and future Detroit mayor Dave Bing. Fellow soul singer Renaldo Benson inspired Gaye to write about political themes and social change in his music. While traveling on his tour bus with the Four Tops on May 15, 1969, Four Tops member Renaldo "Obie" Benson witnessed an act of police brutality and violence committed on anti-war protesters who had been protesting at Berkeley's People's Park in what was later termed as "Bloody Thursday". A disgusted Benson later told author Ben Edmonds, "I saw this and started wondering 'what was going on, what is happening here?' One question led to another. Why are they sending kids far away from their families overseas? Why are they attacking their own kids in the street?" Returning to Detroit, Motown songwriter Al Cleveland wrote and composed a song based on his conversations with Benson of what he had seen in Berkeley. Benson sent the unfinished song to his bandmates but the other Four Tops turned the song down. Benson said, "My partners told me it was a protest song. I said 'no man it's a love song, about love and understanding. I'm not protesting. I want to know what's going on.'" Benson and Cleveland offered the song to Marvin Gaye when they met him at a golf game. Returning to Gaye's home on Outer Drive, Benson played the song to Gaye on his guitar. Gaye felt the song's moody flow would be perfect for The Originals. Benson, however, felt Gaye could sing it himself. Gaye responded to that suggestion by asking Benson for songwriting credit of the song. Benson and Cleveland allowed it and Gaye edited the song, adding a new melody, revising the song to his own liking, and changing some of the lyrics, reflective of Gaye's own disgust. Gaye finished the song by adding its title, "What's Going On". Benson said later that Gaye tweaked and enriched the song, "added some things that were more ghetto, more natural, which made it seem like a story and not a song ... we measured him for the suit and he tailored the hell out of it." During this time, Gaye had been deeply affected by letters shared between him and his brother after he had returned from service over the treatment of Vietnam veterans. Gaye had also been deeply affected by the social ills plaguing the United States at the time, and covered the track "Abraham, Martin & John", in 1969, which became a UK hit for him in 1970. Gaye cited the 1965 Watts riots as a pivotal moment in his life in which he asked himself, "with the world exploding around me, how am I supposed to keep singing love songs?" One night, he called Berry Gordy about doing a protest record while Gordy vacationed at the Bahamas, to which Gordy chastised him, "Marvin, don't be ridiculous. That's taking things too far." Reuniting at their parents' suburban D.C. home, Marvin's brother Frankie discussed the events of his tenure at Vietnam, detailing experiences that sometimes left the two brothers consoling each other in tears. Then after Frankie explained witnessing violence and murder before he was to depart back to the states, he recalled Marvin sitting propped up in a bed with his hands in his face. Afterwards, Marvin told his brother, "I didn't know how to fight before, but now I think I do. I just have to do it my way. I'm not a painter. I'm not a poet. But I can do it with music." In 1969 or 1970, I began to re-evaluate my whole concept of what I wanted my music to say ... I was very much affected by letters my brother was sending me from Vietnam, as well as the social situation here at home. I realized that I had to put my own fantasies behind me if I wanted to write songs that would reach the souls of people. I wanted them to take a look at what was happening in the world. On June 1, 1970, Gaye entered Motown's Hitsville U.S.A. studios to record "What's Going On". Immediately after learning about the song, many of Motown's musicians, known as The Funk Brothers noted that there was a different approach with Gaye's record from that used on other Motown recordings, and Gaye complicated matters by only bringing in a few of the members while bringing his own recruits, including drummer Chet Forest. Longtime Funk Brothers members Jack Ashford, James Jamerson and Eddie Brown participated in the recording. Jamerson was pulled into the recording studio by Gaye after he located Jamerson playing with a local band at a blues bar and Eli Fontaine, the saxophonist behind "Baby, I'm For Real", also participated in the recording. Jamerson, who couldn't sit properly on his seat after arriving to the session drunk, performed his bass riffs, written for him by the album's arranger David Van De Pitte, on the floor. Fontaine's open alto saxophone riff on the song was not originally intended. When Gaye heard the playback to what Fontaine thought was simply a demo, Gaye instantly decided that the riff was the ideal way to start the song. When Fontaine said he was "just goofing around", Gaye being pleased with the results replied, "Well, you goof off exquisitely. Thank you." The laid-back sessions of the single were credited to lots of "marijuana smoke and rounds of Scotch". Gaye's trademark multi-layering vocal approach came off initially as an accident by engineers Steve Smith and Kenneth Sands. Sands later explained that Gaye had wanted him to bring him the two lead vocal takes for "What's Going On" for advice on which one he should use for the final song. Smith and Sands accidentally mixed the two lead vocal takes together. Gaye loved the sound and decided to keep it and use it for the duration of the album. That September, Gaye approached Gordy with the "What's Going On" song while in California where Gordy had relocated. Gordy took a profound dislike to the song, calling it "the worst thing I ever heard in my life". Gaye, who had also begun recording some songs that would later be featured on his later album, Let's Get It On, responded by going on strike from recording anything else for the label unless Gordy relented. Motown executive Harry Balk later recalled that he had tried to get Gordy to release the song to which Gordy replied to Balk, "that Dizzy Gillespie stuff in the middle, that scatting, it's old." Most of Motown's Quality Control Department team also turned the song down, with Balk later stating that "they were used to the 'baby baby' stuff, and this was a little hard for them to grasp." Gordy also felt the song was too political to be a hit on radio and too unusual compared with what was considered a part of the popular music sound of that time to be commercially successful. With the help of Motown sales executive Barney Ales, Harry Balk got the song released to record stores, sending 100,000 copies of the song without Gordy's knowledge, on January 17, 1971, with another 100,000 copies sent after that success. Upon its release, the song became a hit and was Motown's fastest-selling single at the time, peaking at number 1 on the Hot Soul Singles Chart, and peaking at number 2 on the Billboard Hot 100. Gordy was stunned by the news and drove to Gaye's home to discuss him making a complete album, stating Gaye could do what he wanted with his music if he finished the record within 30 days before the end of March and thus effectively giving him the right to produce his own albums. Gaye returned to Hitsville to record the rest of What's Going On, which took a mere ten business days between March 1 and March 10. 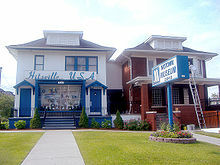 The album's rhythm tracks and sound overdubs were recorded at Hitsville, or Studio A, while the strings, horns, lead and background vocals were recorded at Golden World, or Studio B. The album's original mix, recorded in Detroit at both Hitsville and Golden World as well as United Sound Studios, was finalized on April 5, 1971. When Gordy listened to the mix, he cautioned Gaye of the album's potential of possibly alienating Gaye's core fan base, which was mostly women; however, Gaye refused to budge. Gaye and his engineers did a new sound mix of the album at The Sound Factory in West Hollywood in early May, integrating the orchestra somewhat closer with the rhythm tracks. Though Motown's Quality Control department team feared no other hit released from the album due to its concurrent style with each song leading to the next, Gordy surprisingly allowed this mix to be released that month. The opening 30 seconds of the album's first track, which feature layered vocals, horns, and polyrhythm. "What's Going On" features soulful, passionate vocals and multi-tracked background singing, both by Gaye. The song had strong jazz, gospel, classical music orchestration, and arrangements. The song also featured major seventh and minor seventh chords, which was then unusual for pop music at the time. Reviewer Eric Henderson of Slant stated the song had an "understandably mournful tone" in response to the fallout of the late 1960s counterculture movements. Henderson also wrote that "Gaye's choice to emphasize humanity at its most charitable rather than paint bleak pictures of destruction and disillusionment is characteristic of the album that follows." This is immediately followed in segue flow by the second track, "What's Happening Brother", a song Gaye dedicated to his brother Frankie, in which Gaye wrote to explain the disillusionment of war veterans who returned to civilian life and their disconnect from pop culture. "Flyin' High (In the Friendly Sky)", which took its title from a United Airlines tag, "fly the friendly skies", dealt with dependence on heroin. The lyric, "I know, I'm hooked my friend, to the boy, who makes slaves out of men", references heroin as "boy", which was slang for the drug. "Save the Children" was an emotional plea to help disadvantaged children, warning, "who really cares/who's willing to try/to save a world/that is destined to die? ", later crying out, "save the babies". A truncated version of "God Is Love" follows "Save the Children" and makes references to God. "Mercy Mercy Me (The Ecology)" was another emotional plea, this time for the environment. Funk Brother musician Earl Van Dyke once mentioned that Berry Gordy didn't know of the word "ecology" and had to be told what it was. The song featured a memorable tenor saxophone riff from Detroit music legend Wild Bill Moore. "Right On" was a lengthy seven-minute jam influenced by funk rock and Latin soul rhythms that focused on Gaye's own divided soul in which Gaye later pleaded in falsetto, "if you let me, I will take you to live where love is King" after complying that "true love can conquer hate every time". "Wholy Holy" follows "God Is Love" as an emotional gospel plea advising people to "come together" to "proclaim love [as our] salvation". The final track, "Inner City Blues (Make Me Wanna Holler)", focuses on urban poverty, backed by a minimalist, dark blues-oriented funk vibe, with its bass riffs composed and performed by Bob Babbitt, who also performed on "Mercy Mercy Me" (Jamerson played on the rest of the album). The entire album's stylistic use of a song cycle gave it a cohesive feel and was one of R&B's first concept albums, described as "a groundbreaking experiment in collating a pseudo-classical suite of free-flowing songs." 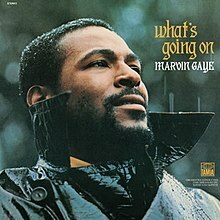 Released on May 21, 1971, What's Going On became Gaye's first album to reach the Billboard Top LPs top ten, peaking at number six, and staying on the chart for over a year, selling over two million copies, within twelve months after its release, becoming Motown's and Gaye's best-selling album to that date until he released Let's Get It On in 1973. It also became Gaye's second number-one album on Billboard's Soul LPs chart, where it stayed for nine weeks as well as staying inside the Billboard Hot Soul/R&B album charts for a record breaking 58 weeks throughout 1971 and 1972. The title track, which had been released in January 1971 as the lead single to promote the album, sold over 200,000 copies within its first week and eventually two-and-a-half-million units by the end of the year. It spent several weeks at number-two on the Billboard Hot 100 behind Three Dog Night's "Joy to the World", and spent five weeks at number one on the Soul Singles chart between March 27 and April 24, 1971. The follow-up single, "Mercy Mercy Me (The Ecology)", peaked at number-four on the Hot 100, and also went number-one on the R&B chart. The third, and final, single, "Inner City Blues (Make Me Wanna Holler)", peaked at number-nine on the Hot 100, while also rising to number-one on the R&B chart, thus making Gaye the first male solo artist to place three top ten singles on the Hot 100 off one album, as well as the first artist to place three singles at number-one on any Billboard chart (in this case, R&B), off one single album. The album had a modest commercial reception in countries such as Canada and the United Kingdom; "Save the Children" reached number 41 on the latter country's singles chart, while the album reached number 56 twenty-five years after its original release. In 1984, the album re-entered the Billboard 200 following Gaye's untimely death. In 1994, the album was certified gold by the Recording Industry Association of America in the United States for sales of half a million copies after it was issued on CD. On July 22, 2013. Via Soundscan it has since soll in excess of 1,6 million copies, furthermore, the album was certified platinum by the British Phonographic Industry for shipments of 300,000 albums. What's Going On was generally well received by contemporary critics. Writing for Rolling Stone in 1971, Vince Aletti praised Gaye's thematic approach towards social and political concerns, while discussing the surprise of Motown releasing such an album. In a joint review of What's Going On and Stevie Wonder's Where I'm Coming From, Aletti wrote, "Ambitious, personal albums may be a glut on the market elsewhere, but at Motown they're something new ... the album as a whole takes precedence, absorbing its own flaws. There are very few performers who could carry a project like this off. I've always admired Marvin Gaye, but I didn't expect that he would be one of them. Guess I seriously underestimated him. It won't happen again." Billboard described the record as "a cross between Curtis Mayfield and that old Motown spell and outdoes anything Gaye's ever done". Time magazine hailed it as a "vast, melodically deft symphonic pop suite". Village Voice critic Robert Christgau was less impressed. Writing in Christgau's Record Guide: Rock Albums of the Seventies (1981), he deemed it both a "groundbreaking personal statement" and a Berry Gordy product, baited by three highly original singles but marred elsewhere by indistinct music and indulgent use of David Van De Pitte's strings, which Christgau called "the lowest kind of movie-background dreck". According to Paul Gambaccini, Gaye's death in 1984 prompted a critical re-evaluation of the album, and most reviewers have since regarded it as an important masterpiece of popular music. In MusicHound R&B (1998), Gary Graff said What's Going On was "not just a great Gaye album but is one of the great pop albums of all time", and Rolling Stone later credited the album for having "revolutionized black music". BBC Music's David Katz described the album as "one of the greatest albums of all time, and nothing short of a masterpiece" and compared it to Miles Davis' Kind of Blue by saying "its non-standard musical arrangements, which heralded a new sound at the time, gives it a chilling edge that ultimately underscores its gravity, with subtle orchestral enhancements offset by percolating congas, expertly layered above James Jamerson's bubbling bass". In his 1994 review of Gaye's re-issues, Chicago Tribune reviewer Greg Kot described the album as "soul music's first 'art' album, an inner-city response to the Celtic mysticism of Van Morrison's Astral Weeks, the psychedelic pop of The Beatles' Sgt. Pepper's Lonely Hearts Club Band [and] the rewired blues of Bob Dylan's Highway 61 Revisited." Richie Unterberger found the album somewhat overrated, writing in The Rough Guide to Rock (2003) that much of its "meandering introspection" paled in comparison to its three singles. A remastered deluxe edition with 28 additional tracks was released on May 31, 2011, to similar acclaim. At Metacritic, which assigns a normalized rating out of 100 to reviews from mainstream critics, the album received an average score of 100, based on ten reviews. In 1985, writers on British music weekly the NME voted it best album of all time. In 2004, the album's title track was ranked number four on Rolling Stone's list of the "500 Greatest Songs of All Time". A 1999 critics' poll conducted by British newspaper The Guardian named it the "Greatest Album of the 20th Century". In 1997, What's Going On was named the 17th greatest album of all time in a poll conducted in the United Kingdom by HMV Group, Channel 4, The Guardian and Classic FM. In 1997, The Guardian ranked the album number one on its list of the 100 Best Albums Ever. In 1998 Q magazine readers placed it at number 97, while in 2001 the TV network VH1 placed it at number 4. In 2003, it was one of 50 recordings chosen that year by the Library of Congress to be added to the National Recording Registry. What's Going On was ranked number 6 on Rolling Stone magazine's 2003 list of the "500 Greatest Albums of All Time", one of three Gaye albums to be included, succeeded by 1973's Let's Get It On (number 165) and 1978's Here, My Dear (number 462). The album is Gaye's highest-ranking entry on the list, as well as several other publications' lists. All songs produced by Marvin Gaye. 3. "Flyin' High (In the Friendly Sky)"
3. "Inner City Blues (Make Me Wanna Holler)"
In 2001, a "Deluxe Edition" 2-CD version of the album was released by Motown, which included the original LP as released, the discarded "Detroit Mix" of the album, and the mono 45 rpm mixes of the singles. Also included was a recording of Gaye's first live concert performance after two years away from the stage following Tammi Terrell's illness and death, performed at The Kennedy Center Concert Hall in his native Washington, D.C., on May 1, 1972. "Jesus is Our Love Song"
James Jamerson – bass guitar "What's Going On", "What's Happening Brother", "Flyin' High", "Save the Children", "God Is Love", and the b-side "Sad Tomorrows"
Bob Babbitt – bass guitar "Mercy, Mercy Me", "Right On", "Wholy Holy" and "Inner City Blues"
Bobbye Hall – bongos "Inner City Blues (Make Me Wanna Holler)"
"Inner City Blues (Make Me Wanna Holler)"/"Wholy Holy"
^ "Acclaimed Music – What's Going On". Acclaimed Music. Archived from the original on 2008-10-22. Retrieved 2008-08-23. ^ a b c Rolling Stone 2012. ^ a b Gulla 2008, pp. 344. ^ Ritz 1991, pp. 126. ^ Posner 2002, p. 225. ^ a b c d e Gulla 2008, pp. 345. ^ Music Urban Legends Revealed #16 Archived 2012-07-12 at the Wayback Machine. Legendsrevealed.com (2009-07-29). Retrieved on 2012-05-14. ^ Gates 2004, pp. 332. ^ a b c d Lynskey 2011, pp. 155. ^ a b c Edmonds 2003, p. 75–78. ^ a b c d e f g h i Lynskey 2011, pp. 157. ^ a b Lynskey 2011, pp. 156. ^ Gaye 2003, p. 72. ^ a b Gaye 2003, p. 75. ^ a b c d e f "Marvin Gaye 'What's Going On?'". July 11, 2011. Retrieved September 8, 2012. ^ a b c d Bowman 2006, pp. 16. ^ Bowman 2006, pp. 15. ^ Bowman 2006, pp. 15–16. ^ a b c d e f "Slant Magazine Music Review: Marvin Gaye: What's Going On". SlantMagazine.com. Retrieved September 8, 2012. ^ Edmonds 2003, pp. 84–85. ^ Bush, John. Review: What's Going On. AllMusic. Retrieved on 2010-01-17. ^ a b Christgau, Robert (1981). "Marvin Gaye". Christgau's Record Guide: Rock Albums of the Seventies. Ticknor & Fields. ISBN 0-89919-025-1. Retrieved August 20, 2016. ^ a b Graff, Gary; du Lac, Joshua Freedom; McFarlin, Jim, eds. (1998). "Marvin Gaye". MusicHound R&B: The Essential Album Guide. Visible Ink Press. ISBN 0-8256-7255-4. ^ Benson, George (February 22, 2004). "The Classic: Marvin Gaye: What's Going On". The Observer. Archived from the original on March 27, 2007. Retrieved January 17, 2010. ^ "Review". Rolling Stone. January 23, 2003. p. 68. ^ Edmonds, Ben (2004). "Marvin Gaye". In Brackett, Nathan; Hoard, Christian (eds.). The Rolling Stone Album Guide (4th ed.). Simon & Schuster. p. 324. ISBN 0-7432-0169-8. ^ Henderson, Eric. Review: What's Going On Archived 2003-12-19 at the Wayback Machine. Slant Magazine. Retrieved on 2010-01-17. ^ Butler, Nick (January 16, 2005). "Marvin Gaye - What's Going On (album review 3)". Sputnikmusic. Retrieved August 20, 2016. ^ Christgau, Robert (December 12, 1971). "Consumer Guide (21)". The Village Voice. New York. Retrieved 2012-10-22. ^ Vince Aletti (August 5, 1971). "Marvin Gaye: What's Going On : Music Reviews". Rollingstone. Rolling Stone. Retrieved 2008-08-23. ^ a b "Marvin Gaye – What's Going On". SuperSeventies.com. Retrieved September 10, 2012. ^ McKeen 2000, pp. 532. ^ "BBC – Music – Review of Marvin Gaye – What's Going On – 40th Anniversary Edition Review". 27 June 2011. Retrieved September 10, 2012. ^ Unterberger, Richie (2003). "Marvin Gaye". In Buckley, Peter (ed.). The Rough Guide to Rock. Rough Guides. p. 418. ISBN 1-85828-457-0. ^ "What's Going On [40th Anniversary Edition] Reviews, Ratings, Credits, and More at Metacritic". Metacritic. Retrieved 2011-08-04. ^ "NME Writers Top 100 Albums Of All Time". NME. 1985-11-30. Retrieved 2011-05-19. ^ "The RS 500 Greatest Songs of All Time". Rolling Stone. 2004-12-09. Retrieved 2008-04-10. ^ "Music of the Millennium". Retrieved September 10, 2012. ^ "The Guardian 100 Best Albums Ever List, 1997". rocklistmusic.co.uk. Retrieved 13 March 2012. ^ "The RS 500 Greatest Albums of All Time". Rolling Stone. Retrieved on 2008-08-23. ^ "Acclaimed Music – What's Going On". Archived from the original on April 20, 2012. Retrieved September 10, 2012. ^ Sounes, Howard (2006). Seventies: the sights, sounds and ideas of a brilliant decade. Simon & Schuster. p. 134. ISBN 0-7432-6859-8. "... such as Bobbye Hall whose insistent bongos can be heard ..."
^ "RPM Top 100 Albums - August 21, 1971" (PDF). ^ "RPM Top 100 Singles - April 17, 1971" (PDF). ^ "RPM Top 100 Singles - August 14, 1971" (PDF). ^ "RPM Top 100 Singles - November 20, 1971" (PDF). Edmonds, Ben (2003). What's Going On? : Marvin Gaye and the Last Days of the Motown Sound. Canongate U.S. ISBN 1-84195-314-8. Gaye, Frankie (2003). Marvin Gaye: My Brother. Backbeat Books. ISBN 0-87930-742-0. Lynskey, Dorian (April 5, 2011). 33 Revolutions per Minute: A History of Protest Songs, from Billie Holiday to Green Day (Google eBook). HarperCollins. ISBN 978-0-06-167015-2. McKeen, William (October 1, 2000). Rock & Roll Is Here to Stay: An Anthology. W. W. Norton & Company. ISBN 978-0-393-04700-4. "500 Greatest Albums of All Time: Marvin Gaye, 'What's Going On'". 2012.